Fingerling potato is a small, stubby, finger-shaped type of potato which may be any heritage potato cultivars. Fingerlings are varieties that naturally grow small and narrow. 2.They’re low in calories and rich in vitamins and minerals. 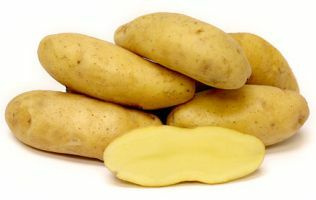 3.Potatoes are high in heart-healthy fiber. 4.The unique color varieties grown at SouthWind are higher in antioxidants. Recipes Using Fingerling potato see Here and Here.